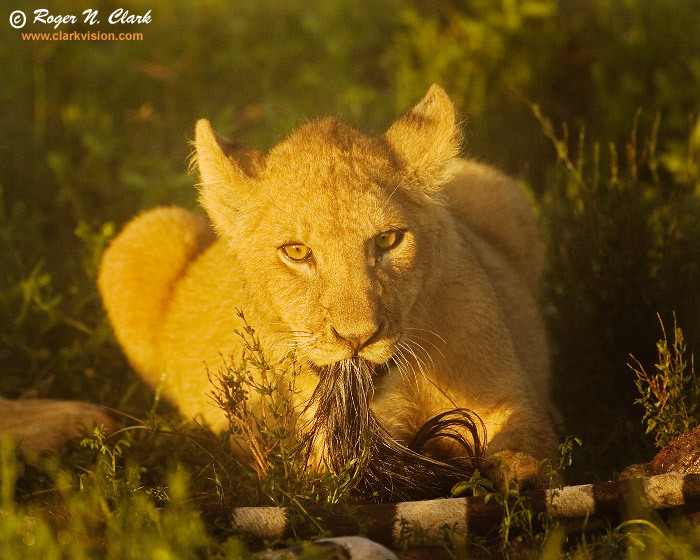 A Lion cub found a new toy: a zebra tail. This image was just after sunrise with golden yellow first light through fog on the Serengeti in Tanzania, Africa. The pride of 9 lions (2 males, 3 females, and 4 cubs) had killed 2 zebras before dawn. Technical: Canon 1D Mark II 8-megapixel camera, Canon 500 mm f/4 L IS lens plus a 1.4x teleconverter giving 700 mm at f/5.6. Exposure: 1/1000 second at ISO 400, f/5.6. This is the full height image with horizontal crop to 8x10 proportions.